I love using mason jars to store my food. They are convenient, keep food fresh, and easy to clean, but most importantly, they are just plain cute! Part of eating mindfully is to notice the taste, texture, and smells of our food. This includes the visual presentation of food as well. Mason jars can elevate the visual presentation of a meal to the next level. Plus, no labeling required since all the ingredients are visible. 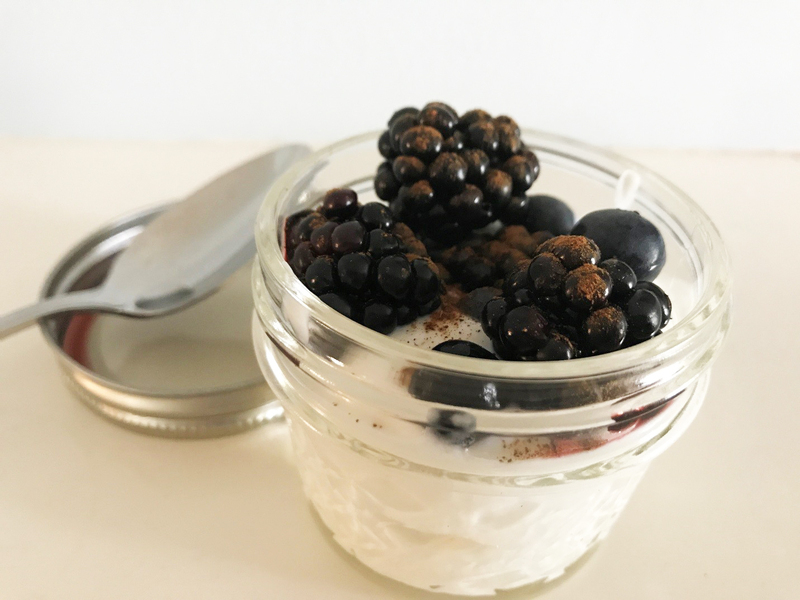 I have rounded up some of my favorite mason jar meals that are perfect to make ahead and grab on the go for hectic mornings. 1. Mason jar omelets. No time to make an omelet in the morning? This grab and go breakfast is high in protein and a quick way to make eggs. First, spray the jar with nonstick cooking spray. Then, simply chop and/or place all of the extras such as green peppers, onions, mushrooms, spinach, ham, or cheese into the jar. Leave in the refrigerator overnight and when ready to cook, crack two eggs into the jar, replace the lid and shake. Remove the lid and microwave on high for 1-2 minutes, checking every 30 seconds. 2. Yogurt parfaits. I love this as a breakfast option because it is so customizable. Just layer plain, nonfat, Greek yogurt in between a handful of your favorite fruit. Top with granola and it’s ready to eat. One of my favorite combinations is a berry parfait which includes strawberries, raspberries, blueberries, and blackberries with a dash of cinnamon. 3. Salad in a jar. The key to mason jar salads is layering the ingredients correctly to avoid soggy lettuce. The first layer of the salad should be the dressing, at the bottom of the jar. For the next layer, it is best to use hearty vegetables such as cucumbers, tomatoes, peppers, carrots, or onions to create a barrier between the dressing and the lettuce. Next should be beans and other less dense vegetables such as avocados, zucchini, or corn. Depending on your preference, the next layers could be grains, protein and/or cheese. Finally, top with salad greens of choice. When ready to eat, shake jar to combine dressing and pour salad into a larger bowl. 4. Burrito “bowl”. Similar to the salad, layering ingredients correctly is key here. First, layer dressing, sour cream, or salsa at the bottom of the jar. Next, include beans and corn. For the third layer include brown rice. Then, add chicken, any other veggies, and finally lettuce and cheese at the top. 5. Soup in a jar. Homemade soups are super easy with mason jars. You can make a large pot of soup and then store in the jars, or make instant soup by adding ingredients, pour hot water in the jar, and let stand before eating. Any soup will work and the options are endless. Try these mason jar recipes to bring to work for a delicious soup/salad combination. These are really easy to make yet healthy meal! 🙂 Thanks for these tips as it really helps a busy person like me. Thumbs up!